March is the fiscal year end in Japan and there tends to be a significant amount of repatriation of foreign earnings as companies look to window dress their balance sheets. This leads many investors to believe that USD/JPY will have a downward bias this month. 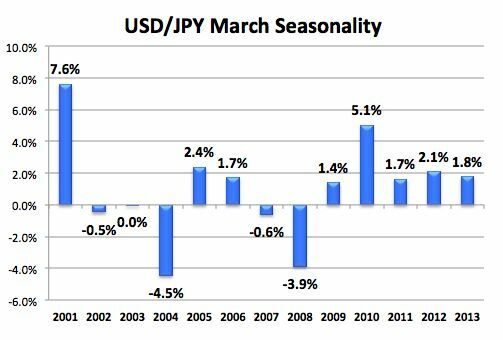 However taking a look at how USD/JPY has behaved in March between 2001 and 2013, we can see that seasonality has very little impact on the currency pair. In fact over the past 6 years, USD/JPY appreciated 5 times in March. Therefore while seasonality is interesting, it should not be blindly traded.